This Broken Dishes baby quilt pattern is easy to sew with quick piecing techniques. The quilt is made entirely with simple half square triangle units. The half square triangle units and be assembled as described -- a method that's perfect for scrap quilts, but they can also be sewn in many other ways. The Magic 8 method is an excellent choice to quickly sew eight identical units. Finished Broken Dishes Block: 6" x 6"
Finished Broken Dishes Baby Quilt: 36" x 42"
Make an orderly Broken Dishes baby quilt, or mix it up and go as scrappy as you like. Identical background fabrics throughout help bring the design together, but you'll find that the quilt looks wonderful with a scrappy background, too. Borders: 1/2 yard for crosswise grain strips— cut side borders first. Batting: Approximately 44" x 50"
Read the quick pieced half square triangle (HST) tutorial, including the optional method on page 5, which explains how to cut the squares oversize and then cut back completed units to the exact size after construction. If you do that, increase the square size listed below by 1/8" to 1/4". Alter cutting instructions if you use another method to make HST units. Each should finish at 3" x 3" -- in other words, measure 3-1/2" x 3-1/2" before sewing them to neighbors. Cut (6) 3-7/8" wide strips of dark fabric from selvage to selvage. Square up one end of each strip and cut a total of (60) 3-7/8" x 3-7/8" squares. 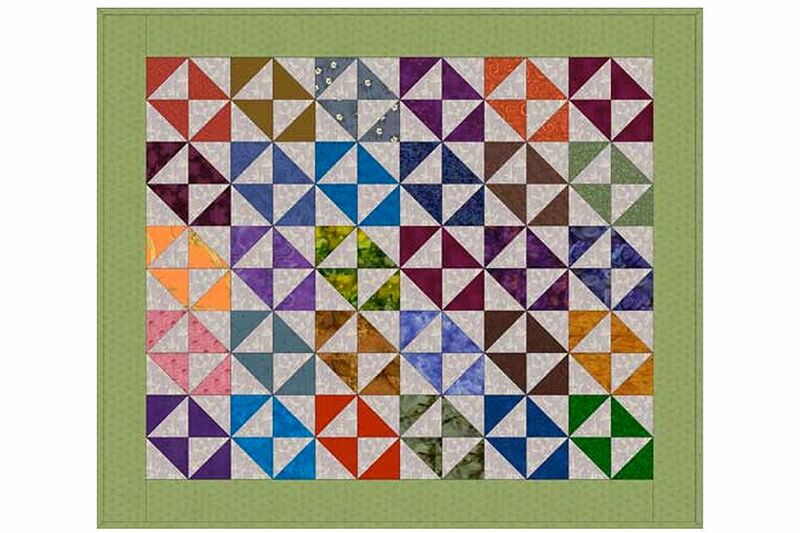 Pair a light square with a dark square and use the quick piecing method linked above to sew them together, resulting in (2) HST units that measure 3-1/2" x 3-1/2". Repeat with two more light and dark squares. Arrange the four HST units into two rows as shown, lower left of illustration. Sew the components of each row together. Press seam allowances towards the darker triangles. Join the rows. Press. The quilt block should measure 6-1/2" x 6-1/2". If it does not, try one of the problem block fixer-uppers. Make a total of 30 Broken Dishes quilt blocks. Arrange the broken dishes quilt blocks into six rows, each with five blocks. Traditionally, all blocks "point" in the same direction as illustrated, but there are no rules about your layout, so try other arrangements if you like. Consider using a design wall to preview blocks for a scrap quilt (they'll stick to a piece of flannel secured to a wall). Move the blocks around until you're happy with the quilt (sometimes it helps to leave the room for awhile, and then re-enter to view it from a fresh perspective). Sew the blocks in each row together, matching seam intersections. Press new seam allowances in adjoining rows in opposite directions. Join the rows, carefully matching seam intersections. Press. Add the border using 3-1/2" wide strips of fabric. Apply the side borders first. Beginners, borders are an opportunity to square up the quilt before the finishing steps, so be sure to use the Border Instructions for assembly. Mark for quilting if necessary. Sandwich with batting and backing and baste. Quilt by hand or machine.